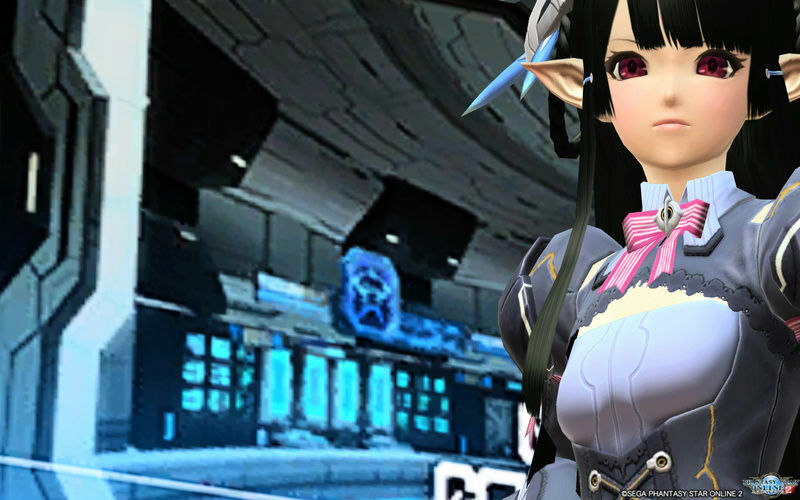 The Famitsu Cup commences in a new update for PSO2! The solo extreme quest mentioned in the November 5th tidbits section is in reference to the new quest coming out in late November. The tidbit is merely stating that this new Solo Extreme Quest is going to have 10 stages. ※ Necky’s Emergency Quest on XH requires a main and subclass level of 70+. The following items will now drop as NT weapons in Mining Base Invasion / Intrusion / Despair / Demise. The following items will now drop as NT weapons in Mining Base Invasion / Intrusion / Despair / Demise and have their rarity changed to ★12. Riding Quests will now reward players with Gavas Tickets until December 7th. Added a [Gavas Exchange Shop] to Necky. Added items to the Treasure Shop. Added the ★10 weapon series “Dio” to Riding Quests. Buffed Riding Quests to make the rare drop rate easier to rise based on the score. Increased the chances for Vegas Illusia to appear in Riding Quests. Due to this adjustment, [Knight Gear] and [Cougar NX] will no longer spawn in this quest. The November 24th issue of Famitsu Magazine will contain the following item codes for the Famitsu CUP. ※ This issue will go on sale November 10th, 2016. 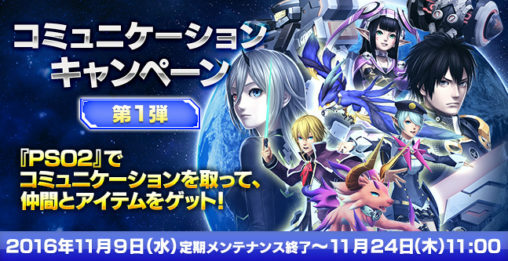 ※ The items can only be retrieved after November 10th @ 11:00 JST. Returning players who haven’t logged in since October 5th’s maintenance will find a grand total 355 items awaiting them at the Visiphone! ! 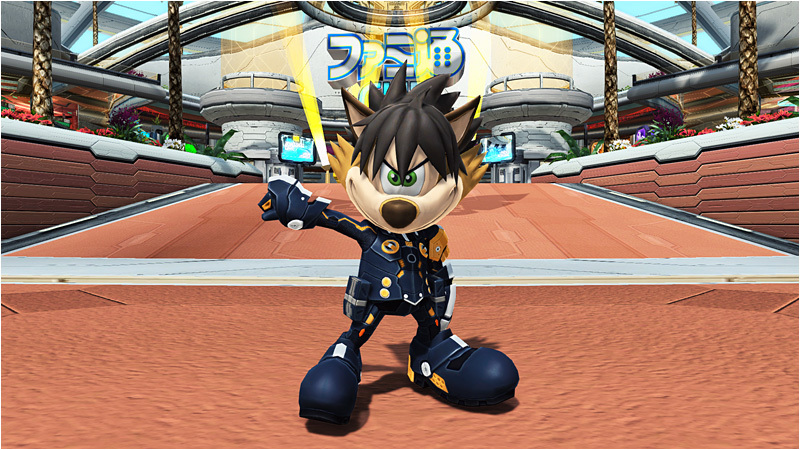 A set of three client order campaigns will be running alongside the Famitsu CUP. The first set will begin after November 9th’s maintenance tasking players with client orders from Hans, Revelle, and Lottie. Form a party and clear the following conditions to receive prizes to your visiphone. Only friends that are listed on your Friends List qualify for the campaign. Deleting friends off your list prior to the end of campaign does not qualify you for the prizes. Performing a ship transfer during the campaign period will change those requirements to the friends on the new ship you’ve transferred to. In addition, friends from the shared ship blocks do not qualify for the campaign. Which Famitsu issue has the PSO2 codes? The one released on Nov 10th (which would be dated 11/24) , or the one dated Nov 10th? It’s the one that goes on sale November 10th. It’s really confusing because there is a November 10th issue already, but don’t buy that one. I would hold off on buying it until they post the cover on Amazon. Despite it being the November 10th issue, that’s not the correct one. It’s the issue that goes on sale November 10th, so basically just wait until the new issue comes out tomorrow. 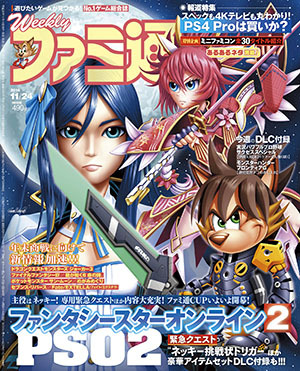 We’re going to post the Famitsu Magazine you need to buy within a new tab in this post. The next time SEGAc fiddles with skills. So… Did anyone had a problem with the Quantum update? For an unknown reason, it made me approx. 2594 files to redownload, like if I did the previous patches again. Can you post an imgur link of your locked events? I want to see the one you have immediately available and the one that is locked. 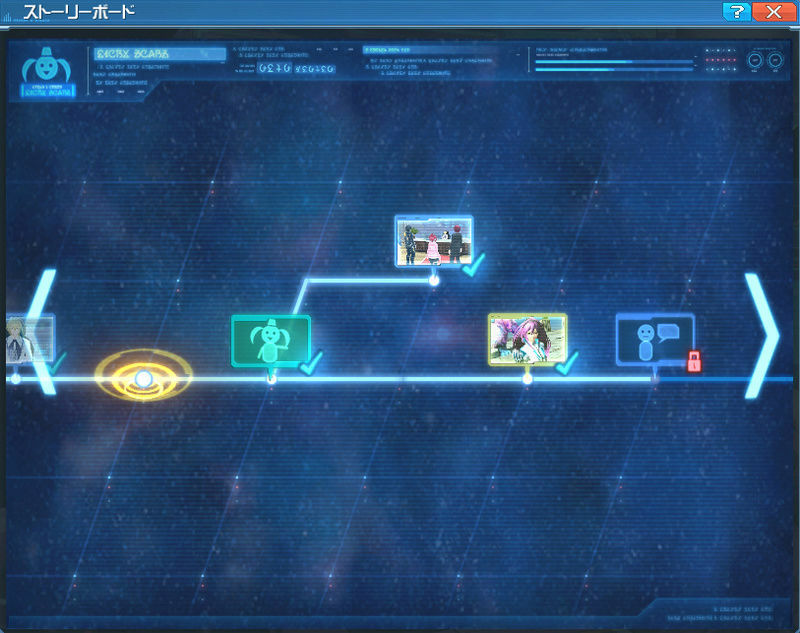 Erf, I did it but forgot it did not appear when we choose not to show windows on screens (Some are showing anyway…) Just, 089-C is cleared, the side cinematic on the upper branch is open, and the node next to the storyquest “Why are you here” have a lock. The storyquest have a clear mark on it. I’ll take screens next time I log in if you still need it. Thanks for now anyway. Do you have a screenshot where it shows the text for the locked Story Board. Nah, worked fine for me. Don’t know for old method. Problems that made crash even before launching began after two old method updates. I could fix things as I could but I just hope it won’t do it again if I really have to do it. Anyways, you might wanna check the Tweaker thread on pso-world for more serious “tech support”. Pretty sure those are irrelevant af, but that’s some kinda permission thing. IIRC I recently deleted them because they were being annoying and filecheck duly DLed new copies. I don’t see why, or *how*, they’d somehow “block” the SB… They did kinda screw with Quantum though IIRC, which is why I deleted and redownloaded them. Try the “fix permissions” etc. from the troubleshooting menu or just remove them manually? Old Method also worked for me. Just had to reinstall the English patch after. Probably just gonna do old method from now on.